Physical, emotional, and informational support through your pregnancy and birth. Private and group classes that will prepare your mind, body, and heart for birth and beyond. Physical, emotional, and informational support through your first year postpartum. 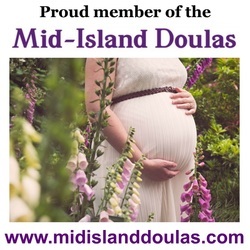 Click here to​ book your FREE consultation now to discover the Cowichan Doula difference yourself! ​"We had several friends who used Kaya for their births and support after, who recommended her to us and we couldn't be happier we did!" Kaya was able to help us prepare for our second child in so many ways we hadn't even considered. From helping to organize our home so it would be ergonomic once baby came; reviewing what we could expect during my labor and birth at CDH; endless comfort measures for pregnancy aches, labor pains, and healing my sore bottom after birth; and emotionally supporting all of us including our six-year-old each time we met with her." Hundreds of families served on Vancouver Island since 2010. Appointments & services available morning, noon, night, and weekends. ​take place in the beautiful centre and in your home.